November 2018 www.coalage.com 19 autonomous haulage systems continued ization," he said. "Komatsu will have dedicated on-site support. The operations that get the most of out the system are the ones where the lines between the customer and Komatsu are blurred and they are working together in a partnership with mutual goals." 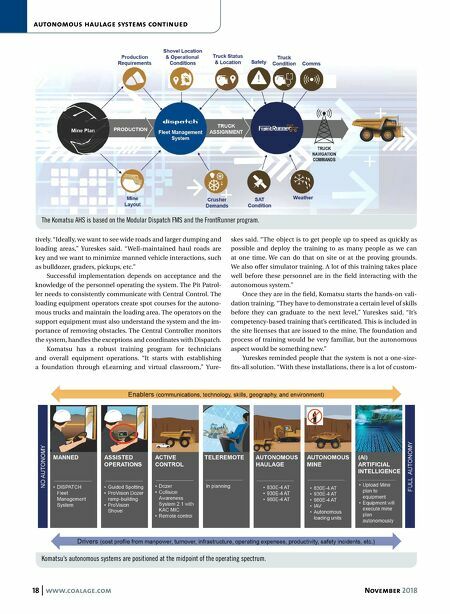 The Technology Guiding the System The Komatsu AHS system relies on two applications: FrontRun- ner, which is controlling the truck; and Dispatch, the same Modu- lar FMS that's already being used at many mines today. "Dispatch doesn't care if the truck is manned or not," Cook said. "It's treating it as an asset and it's trying to determine how to get the most tons out of the system." In the Central Control Room at the Komatsu proving grounds, Cook explained how Modular tests new hardware and software before it's released to the customer. "About 90% of the test work is conducted at Modular Mining's headquarters in Tucson before they bring it to the proving grounds," Cook said. The Komatsu proving grounds opened in late 2015 and the company uses the 700-acre facility to test open-pit mining equip- ment. There are three models of autonomous haul trucks oper- ating at the facility, an 830, 930 and a 980. The loading units vary from a rope shovel to hydraulic front shovels all the way down to wheel loaders. In the real world, one skilled operator can manage as many as 30 trucks. "With these systems, the loader operator has a lot more responsibility," Cook said. "He is the one deciding where the trucks are positioned. With autonomous mining, double-side loading is very easy. The loading tool operators have the confi- dence the trucks will not back into them. If there is an obstacle, the truck will develop a path around it." The manned vehicles have a device telling them the position and route of the trucks and where they will turn. "We no longer need indicators because the operators stop when they see a truck and look at their screen to see where that truck is going," Cook said. The backbone to all of this is the wireless communication. Most mines today use Wi-Fi, the 80211 band, but Cook foresees a mass migration to long-term evolution (LTE) wireless. "With video and all the data coming out of the pits, LTE will be a better application," Cook said. "It's more mobile jumping from access point to access point. Wi-Fi was designed as a stationary system, which works well for offices and factories." None of the technology on the truck is proprietary. "Anyone could buy these parts and cobble them together," Cook said. "What is proprietary is how the different levels of information are integrated into the system and the IP for the system. A PTX-C mobile computer accepts the messages from Centrol Control and disseminates them through the truck's control systems to make it propel, brake, and turn left or right." The trucks use multiple methods — GPS, a set of gyros as well as radar and lasers — to verify its position. Currently, the system connects to two constellations, but the next generation will con- nect to four. The autonomous truck operates with such repeat- able precision that the engineers are now incorporating "vector- ing," where an algorithm shifts the haulage route laterally a meter or so to keep the trucks from wearing ruts in the haul road. FrontRunner also expects to hear regularly from certain sensors on board the truck. "These sensors, such as the steering tel: +1-800-691-6601 email: info@strataworldwide.com www. 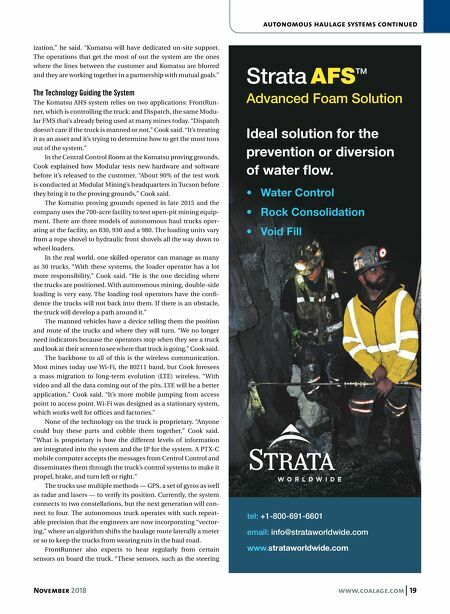 strataworldwide.com Strata AFS TM Advanced Foam Solution • Water Control • Rock Consolidation • Void Fill Ideal solution for the prevention or diversion of water flow.